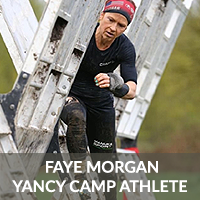 Premier OCR Athlete Faye Morgan - Yancy Camp - Fitness for Everyone! Weekly updated online access to 3 workouts being performed by the OCR athlete you choose to team with, plus 1-2 bonus workouts each week. *All the athletes on the roster are trained by Yancy and all workouts are written in a way that allow them to be easily scaled down if needed. OCR specific Fitness & Challenge Testing Program. You’ll complete the Fitness Testing and log your results within the first few weeks after registering and periodically you’ll re-test and log so you can keep track of your improvements. *Challenge Testing can be completed whenever you’d like – invite a friend! Scoreboard Program – if you choose, you can mark your Fitness & Challenge results “Public” and your results will populate to our “Scoreboard” that can be viewed by yourself and anyone who visits the site. This provides you with the opportunity to see how you compare to other Yancy Camp athletes as well as motivation to stay consistent with your training which will result in improved scores. Access to our private Facebook group called – Yancy Camp OCR Athletes & Coaches where you can post nutrition, training, racing, gear, life, and any other questions you might have. Your nutrition questions will be answered by one of our Registered Dietitians who have strong resumes in the world of Sports Performance Nutrition. Unlimited Q/A with Yancy through private messaging on his yancyculp@YancyCamp.com email, Yancy Camp or Yancy Culp Facebook page, or @yancyculp Instagram . Yancy spends time every day answering questions that come in. The closed Facebook group and the can be a great place to post general questions for all members to see but if you have private questions you’d like to ask, always feel free to send Yancy a message. Video library that helps describe programmed exercises you may not know how to perform as well as other informational videos. Our goal with this program is to provide you with an OCR training program that helps you bring more structure to your training so you can maximize your training time as you work toward reaching your goals. Our current members have had great success. They are conquering more obstacles out on course and their running and climbing is continually improving. We’re confident you’ll enjoy the program and the results, and we provide it all for only $29/month. Your membership is month to month recurring charge, and you can cancel any time without question. Faye Morgan is a former Marine from Temecula CA, mother of four, combat veteran, and she's a member of the Spartan Pro Team. She has been competing in OCR since 2011, and earned the last coveted Spartan World Champion Master's 1st place podium in 2017 (before the implementation of the age group awards in 2018). Faye was accustomed to running far and muddy as a member of the Marine Corps Marathon team from 2000-2005 and with two combar deployments under her belt. She is the record holder fo rthe Combat Endurance Course at The Basic School (TBS) in Quantico, VA. where lieutenants complete the 6 mile course in full combat gear with weapon. She married a Marine and is now a stay at home mom to four awesome kiddos (Murph 11, Wyatt 8, Logan 5, and Scout 3) who love staying active like their mom. Faye's athletic background consists of competitive gymnastics from age 5 through 14, where she was twice the Washington State Champion at her level, before deciding to transition to varsity level high school sports where she played basketball, volleyball, softball, and ran track at The Lakeside School in Seattle WA. She went on to play both varsity basketball and ran cross country at Whitman Collega in Walla Walla, WA. for four years and upon graduation was commissioned a Second-Lieutenant in the United States Marine Corps. Although Faye is 42 years old, she has hung right in there with the elite field and this year was honored to sign on as a membe of the Spartan Pro Team. Faye has been competiting long and strong in theis sport and the only year she did not have a podium finish since her start in 2011 was in 2015 when she gave birth to her fourth child. In 2018 she stood on seven elite podiums to include both 1st place at Spartan Dodger Stadium and Spartan SoCal Beast. She represents a wide range of athletes from Veterans, parents, and master's athletes. Site Development by Graphic Awakening, Inc.